ANTI BLEMISH SOLUTION! BLEMISH & PIMPLE PILLS! Dr Complexion Anti Blemish and Pimple Pills are clinically proven to clear your skin and give you a fresh and glowing complexion. The blemish pills clear pore clogging bacteria to control acne and restore the skins clarity. 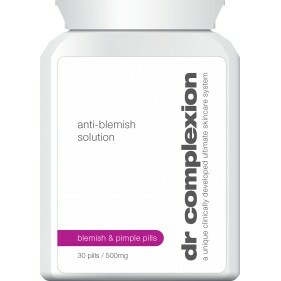 Dr Complexion Anti-Blemish Pills contain unique active ingredients that work hard to provide a powerful internal defence against breakouts; and rapidly reduce the appearance of blemishes and spots. The anti-blemish pills eliminate excess oil and impurities from acne-prone skin; while it clears and tightens pores. Skin will appear fresh, clear and spot free. .
• Clinically proven to clear your skin and give you a fresh and glowing complexion!• Pills clear pore clogging bacteria to control acne and restore the skins clarity!• Provide a powerful internal defence against breakouts!• Rapidly reduce the appearance of blemishes and spots! • Dr Complexion products are formulated using 100% natural ingredients!• Our treatments are clinically tested & developed • Dr Complexion products guarantee great results, fast!• Look and feel great!